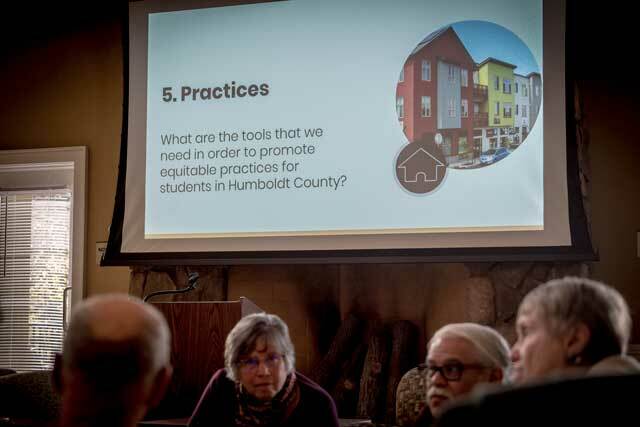 Humboldt State University is developing an innovative new housing education program designed to ease housing barriers for students and build a stronger connection between Humboldt County landlords and student tenants. Feedback from forums of landlords, students, and community members will help inform HSU’s new Educated Landlord and Tenant Program. Under the Educated Landlord and Tenant Program (ELTP), HSU students and landlords will take facilitated courses several times a month. With an emphasis on equity, courses will cover a range of topics such as how to be a good landlord and tenant, implicit bias, indigenous perspectives, emotional and service animals, and personal finance. The program, expected to launch this fall, is one of several HSU initiatives attempting to address housing insecurity — a challenge for college students around the country. One national study reports that 36 percent of college students are housing insecure and 9 percent are homeless. In a separate study of CSU students, co-written by HSU Social Work Professor Jennifer Maguire, 19 percent of HSU students and 11 percent of CSU students reported being housing insecure. HSU’s Housing Liaison and Social Work graduate student Chant’e Catt (‘18, Sociology) sees ELTP as an important part of the solution. Catt experienced homelessness when she transferred to HSU two years ago and, since then, has been a vocal champion of affordable housing for students. She co-founded HSU’s Student Housing Advocate Alliance and has worked with HSU, city leaders, local businesses, and nonprofits to address equitable housing practices. In her new role as HSU’s Off-campus Housing Coordinator, Catt helps students find housing, understand tenant rights, and find resources. So far, she has assisted 385 students with a range of off-campus housing issues that intersect with homelessness, suicide, racial discrimination, poverty and more. At the same time, she focuses on implementing longer-term solutions such as ELTP, which encourages landlords and tenants to work together. That collaboration showed in November when Catt and her team hosted a town hall meeting. The forum, geared toward landlords and property managers, gave participants a chance to discuss students’ housing concerns and share their own perspectives and ideas. Two upcoming free forums will provide more details of the Educated Landlord and Tenant Program and gather feedback. — Students are invited to hear more details and provide feedback on Friday, Feb. 8, 11:30-1:30 p.m. at the UC Banquet room. — ELTP curriculum and research will be presented on Friday, Feb. 15 at 11 a.m. – 2 p.m. at the D Street Community Center in Arcata. Contact Chant’e Catt at housingliaison@humboldt.edu or 707.826.5509 for more details.